CHICAGO (AFP) -- South Korea’s Chella Choi and American Danielle Kang, each seeking her first major title, both birdied the 18th hole to share the lead after Saturday’s third round of the Women’s PGA Championship. Choi fired a three-under par 67 while Kang shot 68 to leave both on 10-under 203 after 54 holes at Olympia Fields near Chicago in the second major tournament of the LPGA season. “I feel very good right now,” Choi said. “My shot and my putting, very good the last couple of weeks, so I have confidence. 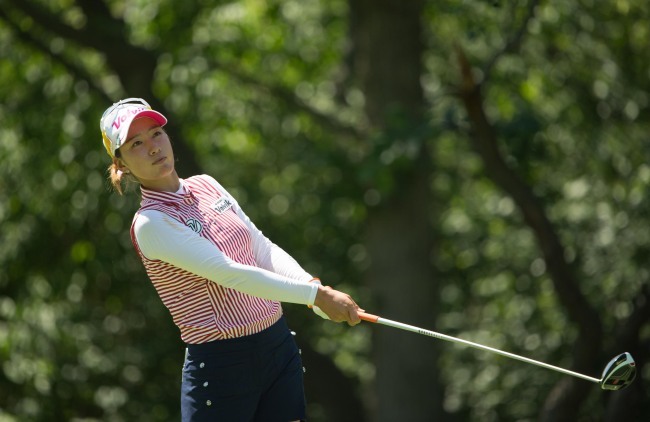 Choi, a 26-year-old from Daegu, won her only LPGA crown at the 2015 Marathon Classic. Her best finish in any major was a share of fifth at this event in 2013. Kang, a 24-year-old from San Francisco, managed her best major finish with a share of 14th at the 2012 US Women’s Open. The two-time US Women’s Amateur champion had her best LPGA finish of third in 2013, but she will try to make her first win a major. “I’ve been working on my game every day to get better,” Kang said. “All I could do is work on my game and hope that every day, just chip away at your game, and it gets better every day and that’s where it’s getting at. South Korea’s Shin Ji-yai was third on 205 after a sizzling 64 with defending champion Brooke Henderson of Canada fourth on 206 and South Koreans Amy Yang and Kim Sei-young sharing fifth on 207. Choi opened and closed her bogey-free round with birdies on par-5 holes, adding birdied at the par-4 eighth and 14th holes. Kang, who shared the lead with Kim when the day began, birdied all three par-5 holes -- the first, last and sixth -- while matching Choi‘s birdies on eight and 14 as well. But she stumbled with bogeys at the par-4 third and par-4 16th. Former world number one Shin left the LPGA in 2014 after 11 wins that included two majors, but she hasn’t had a top-10 major showing since 2013. She made six birdies in her last 10 holes to put herself in contention for another. “I think tomorrow is going to be a little bit hotter and also windy, so I try to enjoy the wind, like a friend,” Shin said. POTOMAC, Maryland (AFP) -- Sweden’s David Lingmerth stumbled to a three-over par 73 Saturday but clung to a one-stroke lead over American Daniel Summerhays after the third round of the US PGA National. Lingmerth had two birdies, three bogeys and a double bogey over the 7,107-yard TPC Potomac layout to stand on seven-under 203 after 54 holes. Lingmerth, seeking his second PGA title after taking the 2015 Memorial, won a 2012 developmental tour event on this course, hosting its first PGA event since 2006. And he’s chasing his first wire-to-wire victory. Summerhays shot 70 to stand second with compatriot Spencer Levin firing the day’s low round, 65, to reach third on 205, one stroke ahead of South Korea’s Kang Sung and Australians Geoff Ogilvy and Curtis Luck. Severe thunderstorms caused a 91-minute delay and together with afternoon heat provided tougher conditions for the leaders. Lingmerth opened with a bogey but birdied the par-five second after dropping his third shot four feet from the cup. He then found water off the fourth tee and made double bogey, trimming his edge to one shot. “Got off to a bit of a rough start,” said Lingmerth. “Missed a couple tee shots to the left, which is something I don’t usually do, and it maybe got me a little unnerved with tee balls for the rest of the day because I didn’t hit as many fairways as I usually do. Lingmerth began the back nine with a bogey, taking five shots to reach the green after finding rough, native grass and a bunker. “Definitely a different way of playing it,” Lingmerth said. He answered with a birdie at the 299-yard par-4 14th, nearly driving the green and leaving his second shot inches from the cup. But Lingmerth, who began the tournament with back-to-back 65s, made bogey at the par-3 17th, finding a bunker off the tee and missing a five-foot par putt.